Mortal Kombat has come a long way since its 1992 arcade debut, with its initial roster of seven playable characters, three bosses (including the iconic multi-limbed Goro) and the once-shocking concept of a fatality. 27 years later, the series has expanded over 11 games - and multiple comic, TV and movie spin-offs - to incorporate 78 characters, from stalwarts like Scorpion and his legendary refrain of 'Get over here! ', to oddities like Hsu Hao, who resembles a Hulk cosplayer from the North Korean army. With Mortal Kombat 11 launching on all console formats and PC this April 23rd, its developer NetherRealm Studios have had to make some tough choices to trim the playable roster back to 22 (currently confirmed) characters. How do the developers choose who to include? How closely do they monitor fan feedback? What determines each character's importance to the plot? 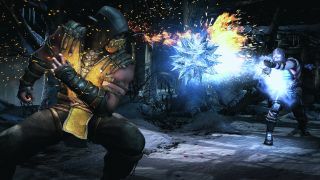 Official Xbox Magazine spoke to NetherRealm studio head, Shaun Himmerick, to learn about their selection process, and series' creator Ed Boon's mysterious character spreadsheet. What makes story so important to the team, where it’s more often an afterthought for fighting games? We feel it is important for the game to have different experiences. Online player vs player, single-player towers and story, all offer a different feel and experience to players. Additionally, the lore of Mortal Kombat is so rich with stories and strong characters. We enjoy, and hope the players enjoy, the storytelling the game can do through the robust story mode experience. The timeline gets kind of complicated after all these games, how did you approach keeping the story fresh for Mortal Kombat 11? The general approach to story was to make sure that it expanded both the depth and breadth of our universe by introducing intriguing new characters and places. Most notable is new our new boss, Kronika, and her hourglass. Through them we learn of the much larger battle being waged in the MK universe. The depth of the MK universe has been expanded by giving our characters’ histories and relationships new dimension. The game’s story mode, in-game dialogue and the individual tower endings all work together to deepen our understanding of who our characters are and why they fight. How do you approach trying to one-up yourselves on Fatalities with each game? That is always a fun challenge. There has been such an awesome history of the characters’ Fatalities. There are always a few emails that go out to the entire team to, “Please, send in your Fatality ideas!” With a large studio, that generates a lot of great ideas. Then a smaller group does some filtering, organising and more brainstorming. They look for as many brand-new ideas as they can. They also look back at old Fatalities and see if there is any homage that can be done with our newer technology that can be awesome fan-service. How do you go about deciding which characters make it in and which don't? That is a harder and longer process than I think people would imagine because there are so many factors to account for. Who was in the last game? What does the story need? Who hasn’t been in a game for a while? Who have the fans been clamouring for the most? Who are the must-haves for this game? Who does the design team have gameplay ideas for already? Who do the artists have ideas for already? Are we looking to bring any new characters into the MK universe? Do we have enough heroes? Do we have enough ‘evil’ characters? Just getting those lists together is always more characters than could fit into a game, so we have to cut it down and make some hard choices because there are so many characters we all want to be in the game. I think fans would go crazy if they could see Ed Boon’s spreadsheet of that process. On that note, how do you handle bringing new characters into the fold? Are certain things dialled up to make them more appealing? The most important part about bringing new characters into the MK universe is making sure they feel like they have been a part of the universe all along. We don’t want them to feel any different than the rest of the established characters. We do try and give new characters mechanics that haven’t existed before, but still have that MK feel. Take our new character Geras for example, he can actually take time off the match timer, add time to the match timer and even rewind time. This is something we have never done before, but all still fits in the MK universe. There are lots of changes to the core fighting for Mortal Kombat 11 – what’s been your goal this time around? What ‘feel’ is the team going for? The big changes we made to the core fighting mechanics for MK11 were separating the players’ meter and having Fatal Blows not require meter. Before, the player was forced to manage one bar of meter for both offensive and defensive attacks. By separating the meters, players can break out of a combo and still have meter to amplify special attacks. The player also regains meter over time, it no longer requires the player to take or receive damage to fill up their meter. Fatal Blows are similar to X-ray moves that we had in Mortal Kombat X, however they no longer require the player to use meter. Before, players were required to decide on whether to use their meter to perform an X-ray, combo breakers or to enhance special moves. Fatal Blows can only happen when the player’s health reaches below 30%, and it can only be used once per match, it’s really a nice comeback feature that can tilt the match in either direction if you can land it. "If you tweet at Ed Boon (@noobde) today about a character you want in MK11, it’s too late for the on-disc roster for sure, but maybe DLC"
How much do you, or are you able to, take on-board fan requests and include things at the suggestion of the MK community? I think the fans influence the game more than they realise. However, not when they think they are. For example, when MKX came out we paid a tonne of attention to fan response and feedback, same with Injustice 2, and so many decisions the studio made about MK11 were influenced by fan responses to past games. We even had focus tests done with our previous games to ask specific questions of the fans to help influence decisions for the newest game. Most things fans ask for and want can’t be accomplished in a day, so there is just a bit more lead time on things. Like, if you tweet at Ed Boon (@noobde) today about a character you want in MK11, it’s too late for the on-disc roster for sure, but maybe DLC. "I've been a Goro guy since Mortal Kombat Deception"
Does this game feature a Krypt? What can we expect from it? Yes, there will be a Krypt! You can expect it to be fun. I don’t want to oversell it, for sure, but I think it’ll be a nice surprise to the players when they see the direction the Krypt has taken in this game. Are there any other game modes included within the game? I sometimes forget everything we’ve already announced, but I know I can say this. Yes, because we plan to keep adding to the game and supporting the game well after launch. The features planned to be added to the game even in the first couple months are pretty awesome. There is more coming. Finally, who is your favourite character to play with? And do you have a particular set up for that character? Favourite characters are always tough. I’ve been a Goro guy since Mortal Kombat: Deception, I was a Liu Kang guy before that. In Mortal Kombat 11, I’m again leaning toward Liu Kang, but the final gameplay polish is not on the characters yet and some others are also in contention!